Recreational or sports fishing is a multi-billion dollar industry worldwide and in many countries represents an important social and cultural activity. In some regions, it also contributes significant income to tourism and tackle businesses. In addition to its importance from a social and economic standpoint, the impact of recreational fishing on the environment and on food webs can often be substantial. This important book represents the major output from the 4th World Recreational Fishing Conference held in Norway in June 2005. The conference focused on several topics and targeted all stakeholders in the recreational fishing sector, including researchers, managers, NGO representatives and businesses. This book reflects that diversity, encompassing a variety of approaches within its carefully selected and fully peer-reviewed chapters. 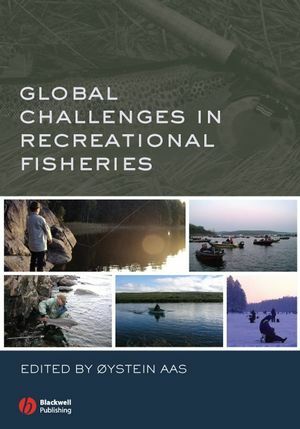 Global Challenges in Recreational Fisheries is an essential purchase for fisheries managers, multidisciplinary fisheries scientists, marine and freshwater biologists, ecologists and environmental scientists. The book is highly relevant for graduate university courses in fisheries management and fisheries sciences. Libraries in all universities, government fish and wildlife agencies and research establishments where these subjects are studied and taught will need copies of this important publication. Dr. Øystein Aas is a Senior Research Scientist at the Norwegian Institute for Nature Research in Lillehammer, and a Visiting Professor at the Norwegian University of Life Sciences, Ås and University of Tromsø, College of Fishery Sciences, Tromsø, Norway. 2 An International Perspective on Recreational Fishing (Chapter editor: R. B. Ditton). 2.1 Overview (R. B. Ditton). 2.2 Overview of Recreational Fishing in Australia (D. Reid). 2.3 Current Status and Challenges Facing Recreational Fishing in the Peoples Republic of China (J. Shen). 2.4 Recreational Fishing in Finland (A.L. Toivonen). 2.5 The Social and economic significance of recreational fishing in Germany (R. Arlinghaus). 2.6 Recreational fishing in Lithuania: Putting Lithuania on the recreational fishing map in Europe (A. Domarkas and E. Radaityte). 2.7 Recreational Fishing in Malaysia (Z.M. Zakariah). 2.8 Recreational angling in the Netherlands: Participation, trends and management (T.W.P.M. Aarts). 2.9 Recreational fishing in Sweden (T. Eriksson). 2.10 An overview of angling in the United States of America (G.C. Radonski and A.J. Lofthus). 3 Meaning and relevance of the ecosystem approach to recreational fisheries management, with emphasis on the importance of the human dimension (R. Arlinghaus and I.G. Cowx). 4 Biological impacts of recreational fishing resulting from exploitation, stocking and introduction (C. W. Lewin, D.P. McPhee and R. Arlinghaus). 5 Marine recreational fisheries challenges and Marine Protected Areas, comparison between the Mediterranean and Australia (D. P. McPhee, A. Gordoa and X. Illas). 6 European sea bass in the North Sea; past, present and future status, use and management challenges (J. E. Colman, M. G. Pawson, J. Holmen and T. O. Haugen). 7 Scale and participation in recreational fisheries management – Nordic examples (P. Salmi, E. Neuman and T. Hakaste). 8 Substitution in recreational fishing (B. Gentner and S. Sutton). 9 A bioeconomic analysis of differing management regimes in recreational fisheries (J. O. Olaussen and A. Skonhoft). 10 Economic impact of angling in Iceland and Scotland (S. Agnarsson, A. Radford and G. Riddington). 11 Trends and developments in catch and release (Chapter editor D. Policansky). 11.2 Factors affecting Catch and Release Mortality of Striped Bass Caught on Natural Bait in Chesapeake Bay (R. Lukacovic and J. H. Uphoff Jr.). 11.3 Potential Effects of Circle Hooks on the United States Recreational Atlantic Billfish Fishery (J. Schratwieser). 11.4 The Atlantic Salmon Catch and Release Story (E. B. Thorstad, T. F. Næsje, G. W. Mawle & D. Policansky). 11.5 The Challenge of Ethical Angling: The Case of Catch and Release and its Relation to Fish Welfare (R. Arlinghaus). 12 Competitive Fishing; Trends, Opportunities and Challenges (Chapter editor: H. L. Schramm Jr.). 12.1 Competitive Fishing and Its Role in Recreational Fisheries Management (H.L. Schramm Jr. and J.C. Harrison). 12.2 Socio-economic analysis of competitive fishing in Poland (A. Wolos, H. Mioduszewska and H.L. Schramm Jr.). 12.3 Legislative treatment and current status of competitive fishing in Germany (T. Meinelt, R. Arlinghaus and K. Jendrusch). 12.4 From the Inside Looking Out: A Tournament Organization’s Perspective on Growing Competitive Fishing (C. Evans). 13 International fishing tourism – past, present and future (T. Borch, Ø. Aas and D. Policansky). 14 Subsistence versus Sport: cultural conflict on the frontiers of fishing (J. Lyman). 15 Recruiting new anglers; driving forces, constraints and examples of success (R. Wightman, S. Sutton, B. Matthews, K. Gillis, J. Coleman and J.R. Samuelsen). 16 The role of non-government organisations in recreational fisheries management – challenges, responsibilities & possibilities (J. C. Harrison and J. Schratwieser). 17 Recreational fisheries in the 21st century: towards a Code of Conduct (I.G. Cowx & R. Arlinghaus).